An Oriental Rug Tale - From Sheep To Rug! 1. The first step is to build a loom. This is no small job. I'm no carpenter, so I thought the easiest way to show this to you was through some pictures. If you click on this PDF file you will see a very complete breakdown concerning the construction of a full sized weaving loom. This file will open in a new window. When your done viewing, just close the window out. 2. Hopefully, while you've been building your loom, someone's been growing some cotton! Cotton yarns are strung up on the loom vertically. They form the warp fibers in your rug. Warp fibers run lengthwise in your rugs backing. Weft fibers run horizontally. Cleaners remember this by the old phrase "weft fibers run weft to right". It's not that witty, but it definitely helps a fella remember which is which! 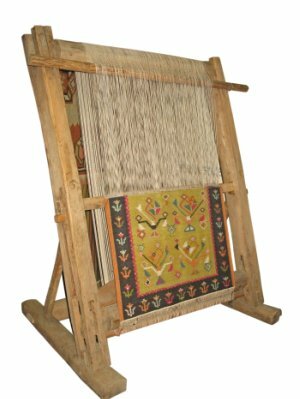 In the picture below, note the cotton warp fibers running from top to bottom on the loom, with a partially completed rug in process. 3. Quick! Somebody raise some sheep! 4. In order to dye the wool, someone has to manufacture the vegetable dyes needed. 5. The rug's design is decided on. The design is transferred to a full scale graphic template called a cartoon. Each tiny square represents one knot. There can be as many as 300+ knots per square inch! 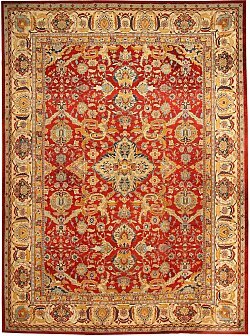 This process will take between several weeks and several months depending on the size and intricacy of the rug, and whether a single weaver or a team of weavers are working on it. We now have a finished product, ready to be shipped state-side, and enjoyed in your family room, dining room, or wherever you've decided to place it.